Taking a break from the studio after finishing another new painting (you’ll get to see it later! ), I had the pleasure of visiting the tiny St. Stephen’s Chapel this weekend in Vankoughnet. Vankoughnet was originally a significant logging town and depot and is now a quiet rural community set on the banks of the Black River in Muskoka. The church was built on land donated by the McMurray’s in 1891. It is one of the smallest churches I have ever seen, coming in around 900 sq. ft, including the chancel and vestry. St. Stephen’s, now a chapel, was originally a ‘sister’ church to St. Paul’s in Uffington which has now been completely demolished. (See Evanescence). 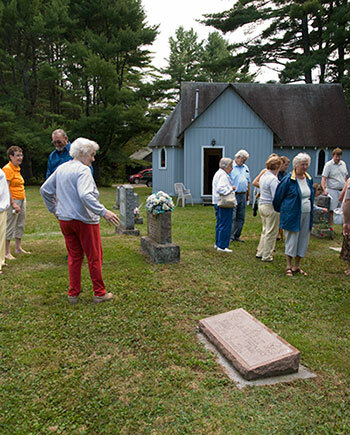 A Requiem service was held along with a Cemetery Tour led by Jennifer Milne. It was a wonderful opportunity to see the little building a hive of activity. There were representatives of many of the pioneer families in attendance – the Sampson’s, the Weaver’s, the Flaherty’s, the Gallaughers – and others. Lots of wonderful vignette’s were shared including how school teachers often had a very short career in Vankoughnet. Being a logging town, there were a lot more men than women. Many of them struggled to find wives because most of the families were already intermarried and most of the girls in town were cousins. School teachers in the late 19th and into the 20th century were most often women – and women could only teach if they were unmarried. Needless to say, there was competition for her attention and a new teacher was often required every term. 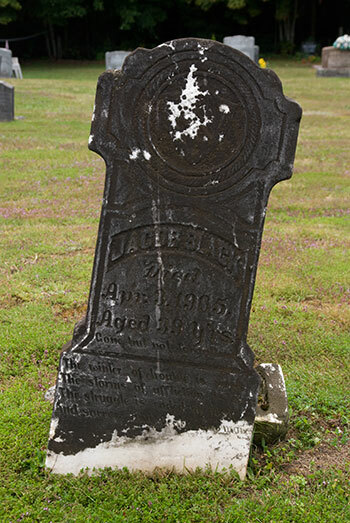 The stone above belongs to Jacob Black – a character everyone called “Jake”. 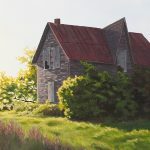 He is also a relative of one of the local paper’s columnists and past president of the Muskoka Heritage Foundation, Ken Black. After the Tour, I mingled with some of the older citizens of Vankoughnet, including relatives of the last resident of the Flaherty House. The Flaherty House, above, was the fanciest and most beautifully finished house in town at the turn of the century. It often housed guests of distinction and was even home for the year of one of the ladies I met on Saturday. Her grandmother lived there until she passed away. 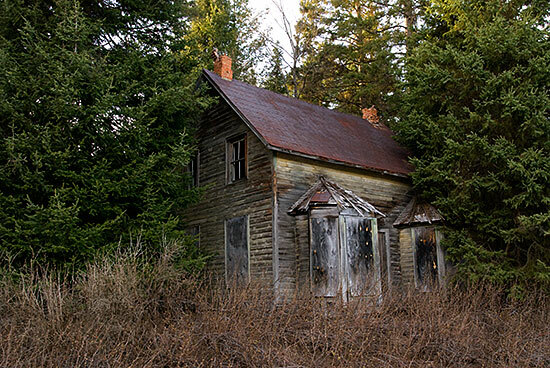 The house has been empty for around 60 years. For a wooden structure to still be standing after all that time, it must have been built exceptionally well. She is both a Weaver and a Flaherty and her nephew, architect Shawn Gallaugher is looking to rebuild the town square and include both banquet space so that St. Stephen’s might see weddings again as well as a logging museum. 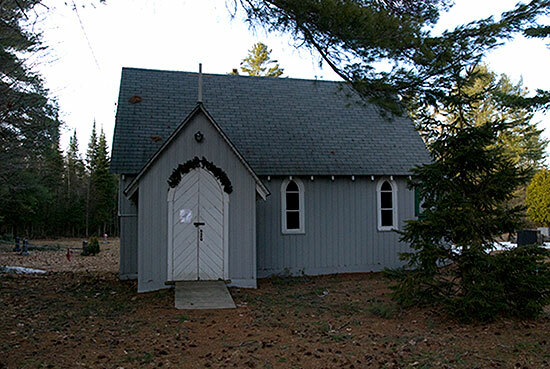 As seems to be the way of things in this day and age, congregations are shrinking and the future of St. Stephen’s, recently made a Chapel of St. Thomas in Bracebridge, is in question. Members who contributed so much have passed on and these old buildings are always in need of maintenance. Currently plans are in the works to raise funds to restore some of the stained glass in the Chapel. I plan to meet further with Ms. Milne. There is much work to be done to ensure that St. Stephen’s does not meet the fate of the, once extraordinary, St. Paul’s. 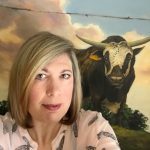 I love your real-life Ontario history. It’s great to hear you share these first hand stories. Michelle, Thanks for sharing the beautiful photographs of St. Stephens. There’s nothing I love more than exploring old churches. 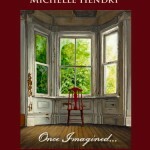 Have you ever considered writing a book? Very interesting post Michelle and i really love the first photo ! Gosh I can hardly stand looking at these because it makes me want to be there exploring them so badly. I’ve got to find some abandoned places here. A friend just told me about some but it’s getting the time from work to drive the few hours there. I’ve seen a lot of Pueblo ruins but they are state or fed or NA owned. I would just love to find a ghost town and explore without paths, guided tours, etc. 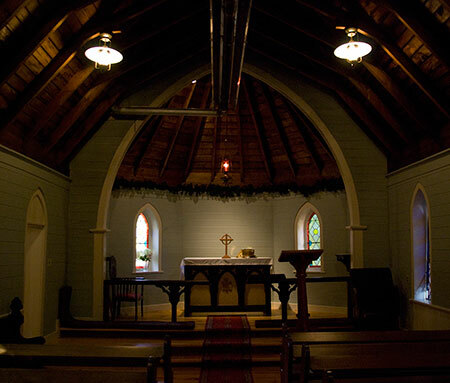 The chapel is so serene, my first thought was I would LOVE to live in a house like that, only with a bit more light. I love all the curves and the soft light. I could just sit there and sit there and not want to move. It feels so quiet and peaceful. BUT…do you know which photo I REALLY gasped over and wanted to walk right into and explore?? Well, you know me well enough now that I’m sure you’re sitting there saying, “Yup, the Flaherty House. Gosh, I have tears in my eyes. Your work is….I can’t find a word big enough. Your work is SO emotional for me. Do you feel emotional, and I think you will relate to that, understand what I mean. Hugs to you too, Robin… I get even more excited by these places because of your enthusiasm! So nice to read more after seeing your photos of this house on Flickr tonight. The interior of the church is amazing! I wouldn’t have expected it to look like that! My great grandfather built this church. It is delightful to see your beautiful pictures.